For the footballer, see Aleksandar Ranković (footballer). Aleksandar Ranković (nom de guerre Leka; Serbian Cyrillic: Александар Ранковић Лека; 28 November 1909 – 19 August 1983) was a Yugoslav communist of Serb origin, considered to be the third most powerful man in Yugoslavia after Josip Broz Tito and Edvard Kardelj. 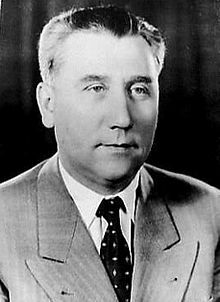 Ranković was a proponent of a centralized Yugoslavia and opposed efforts that promoted decentralization that he deemed to be against the interests of the Serbian people; he ensured Serbs had a strong presence in Serbia's Socialist Autonomous Province of Kosovo's nomenklatura. Ranković cautioned against separatist forces in Kosovo who were commonly suspected of pursuing seditious activities. The popularity of Ranković in Serbia became apparent at his funeral in 1983, which large numbers of people attended. Many considered Ranković a Serbian "national" leader. Ranković's policies have been perceived as the basis of the policies of Slobodan Milošević. Ranković was born in the village of Draževac near Obrenovac in the Kingdom of Serbia. Born into a poor family, Ranković lost his father at a young age. He attended high school in his hometown. He went to Belgrade to work and joined the workers' movement. He was also influenced by his colleagues who, at the time when the Communist Party was banned, brought communist magazines and literature with them, which were read by Ranković. At age 15 he joined the union. [clarification needed] In 1927 he met his future wife Anđa, and a year later he joined the Communist Party of Yugoslavia. Soon he was named Secretary-General of the League of Communists of Youth of Yugoslavia (SKOJ) in Belgrade. In 1928 when he became a member of the Communist Party, Ranković was named Secretary of the Regional Committee of the SKOJ of Serbia. The January 6th Dictatorship didn't influence his political activity. As leader of the Regional Committee of SKOJ he published a flyer which was distributed in Belgrade and Zemun. During the time when flyers were being printed, one of his associates was arrested and soon Ranković was discovered by the police. He was captured in Belgrade in an illegal apartment. Ranković's trial was one of the first trials after the declaration of King Alexander's dictatorship. He was sentenced for 6 years and he spent his punishment in prisons in Sremska Mitrovica and Lepoglava. During his imprisonment he spread communist agenda among younger prisoners. In prison, he organized attacks on the police by political prisoners. He was released in 1935 and after the release he was enlisted to the army. After the military service he worked for the workers' movement in Belgrade. Through the unions he revived activity of the Communist Party. 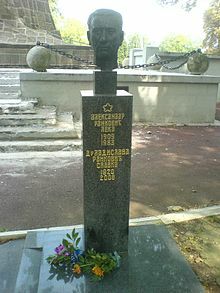 In 1936 he became member of the Regional Committee of Serbia and in 1937 member of the Politburo of the Central Committee of the Communist Party. In January 1939 he started to act illegally under codename "Marko". In May 1939 Ranković participated in the consultations of communists of Yugoslavia in Drava Banovina in Šmarna Gora, and later he participated on the 5th Conference of KPJ held in Zagreb. Ranković was a member of the Politburo from 1940. Ranković was captured and tortured by the German Gestapo in 1941 but was later rescued in a daring raid by Yugoslav Partisans. His wife and mother were killed by the Gestapo during the war. Ranković served on the Supreme Staff throughout the war. He was named a "People's Hero" for his services during World War II. "I, who surveilled everyone, from assembly to bedrooms, was the last one to find out what's being planned for me." In May 1944, Ranković created OZNA, the Partisan's security agency. After the war, he became minister of the interior and chief of the military intelligence agency UDBA, which had replaced OZNA. He fell from power in 1966, ostensibly for abusing his authority by bugging the sleeping quarters of President Josip Broz Tito. He was expelled from the SKJ the same year. His fall from power marked the beginning of the end of a centralized power structure of the League of Communists of Yugoslavia over the country and the social and political separatist and autonomist movements that would culminate in the Croatian Spring and the newly de-centralized Yugoslavia that emerged from the 1971 constitutional reforms and later the 1974 Constitution. Ranković retired to Dubrovnik, where he died on 19 August 1983 after suffering a second heart attack. On Belgrade airport his coffin was awaited only by the representatives of the Veteran's Union (SUBNOR). While he was in the hospital, someone broke into Ranković's house and stole all of his medals, so his family began to gather medals from his former war comrades to display them at the funeral, but in the end SUBNOR provided the replacement medals. It was forbidden to the citizens and organizations to post obituaries. Obituary was only allowed to his family and only on the day of the funeral. Despite all that censorship, the day of the funeral was a major shock to the state and party authorities. No salvos or fanfares were allowed, either but, spontaneously, a huge crowd of people showed at the Belgrade New Cemetery. They applauded and cheered 'Leka, Leka' and since there was no place for everyone, people were climbing on the trees and tombstones. The number of the people who attended the funeral is still not established. State agency Tanjug reported 1,000, while rumors all over Serbia talked about several hundred thousands. Historians and reporters, more-or-less, agreed on 100,000. The authorities were astounded by the events at the funeral, as they expected people forgot about someone who was in complete media and political isolation for almost two decades. By gathering in such crowds, people showed to the government what they think of it, but also what they think of all the allegations, isolation and silence which surrounded Ranković since 1966. Still, the authorities for years after, were still not allowing photos where Ranković stands next to Tito, or to any of the world leaders. Publishing of his memoirs was also banned for years. Historians tried to explain such a large number of people as the first massive public vent after Tito's death in 1980. Many perceived Ranković as a defender of Yugoslavia and believed that if he stayed at power, demonstrations and rebellions of the irredentist Albanians on Kosovo would not happen. They demonstrated for the first time just two years after he was removed from office, in 1968, when in Priština, but also in Tetovo in Macedonia, they cheered "Long live Enver Hoxha" and "Long live Great Albania". Further protests followed in 1971 and 1981. However, actions like taking away the illegal weapons from the Albanians on Kosovo and the Prizren Trials, were neither his individual actions nor a result of his anti-Albanian attitude, as nothing couldn't be done without Tito's approval or knowledge. Serbian historians don't consider him a Serbian nationalist at all, instead they see him as a staunch Yugoslav and Tito's loyal associate who stood by him in all the pivotal moments, not supporting or protecting Serbian politicians which were forced out by Tito, like Blagoje Nešković [sr]. Ordinary people considered him both a victim and a symbol of one era. Victim of both the Communist government and of an anti-Serbian conspiracy, as they see him as a Serbian nationalist who repressed the Albanians on Kosovo. ^ Aleksandar Rankovic - Political Profile of A Yugoslav "Stalinist"
^ a b Melissa Katherine Bokovoy, Jill A. Irvine, Carol S. Lilly. State-society relations in Yugoslavia, 1945–1992. Scranton, Pennsylvania, USA: Palgrave Macmillan, 1997, p. 295. ^ Independent International Commission on Kosovo. The Kosovo report: conflict, international response, lessons learned. New York, New York, USA: Oxford University Press, 2000. p. 35. ^ a b Lenard J. Cohen. Serpent in the bosom: the rise and fall of Slobodan Milošević. Boulder, Colorado, USA: Westview Press, 2002. p. 98. ^ a b "Aleksandar Ranković. Narodni heroj ili domaci izdajnik" (in Serbian). Yugoslavia Times. 1 October 2012. Archived from the original on 7 December 2013. Retrieved 8 December 2013. ^ Gunther, John (1961). Inside Europe Today. New York: Harper & Brothers. p. 350. LCCN 61-9706. ^ Mijat Lakićević (3 January 2017). "Paradigma Ra(n)ković" (in Serbian). Peščanik. ^ "Sudbina Rankovića, sudbina Jugoslavije" (in Serbian). Radio Television Serbia. 19 August 2013. Doder, Duško; Branson, Louise (1999). Milosevic: Portrait of a Tyrant. Free Press. ISBN 0-684-84308-0. Miller, Nick (2007). The Nonconformists: Culture, Politics, and Nationalism in a Serbian Intellectual Circle, 1944–1991. Central European University Press. ISBN 978-963-7326-93-6. Marcus, Marcus (1997). Croatia: A Nation Forged in War. Yale University Press. ISBN 0-300-06933-2.